With all the different gearbox failure modes, it’s important to be aware of the various tests that can be used to develop and confirm a hypothesis for the probable cause of failure. Lubricant samples can provide immediate means to detect contamination or other adverse changes to the lubricant. These samples can be sent to a laboratory for further analyses. There are also a number of tests that can be performed on-site and at a low cost to check for lubricant contamination or oxidation. The simplest test is visual appearance. Often this test will disclose problems such as gross contamination or oxidation. Look at the lubricant in a clean, clear bottle. A tall, narrow vessel is best. Compare the sample to a sample of new, unused lubricant. The oil should look clear and bright. If the sample looks hazy or cloudy, or has a milky appearance, there might be water present. The color should be similar to the new oil sample. A darkened color might indicate oxidation or contamination with fine wear particles. Tilt the bottle and observe whether the used oil appears more or less viscous than the new oil. A change in viscosity might indicate oxidation or contamination. Look for sediment at the bottom of the bottle. If any is present, run a sedimentation test. If any sediment is visible during the appearance test, a simple test for contamination can be performed on-site. Place a sample of oil in a clean, white cup made from a non-porous material that is compatible with the lubricant. Cover and allow it to stand for two days. Carefully pour off all but a few milliliters of oil. If any particles are visible at the bottom of the cup, contaminants are present. Resolution of the unaided eye is about 40 microns. If the particles respond to a magnet under the cup, iron or magnetite wear fragments are present. If they don’t respond to the magnet and feel gritty between the fingers, they are probably sand. If another liquid phase is visible or the oil appears milky, water is likely present. can limit the contact area and cause macropitting. Carefully sniff the oil sample. Compare the smell of the used oil sample with that of new oil. The used sample should smell the same as new oil. Oils that have oxidized have a “burnt” odor or smell acrid, sour or pungent. If the presence of water is suspected in an oil sample, a simple on-site test can be performed. Place a small drop of oil onto a hot plate at 135 degrees C. If the sample bubbles, water is above 0.05 percent. If the sample bubbles and crackles, water is above 0.1 percent. When carrying out the crackle test, the inspector’s health and safety must be taken into consideration by wearing eye protection, for example. Why Take Oil Samples from a Failed Gearbox? Does the oil meet the original equipment manufacturer (OEM) specification? Does the oil contain evidence useful for finding the root cause of failure? Is the oil representative of the service oil? Does the Oil Meet the OEM’s Specification? Micropitting often will have a pattern that indicates misalignment. 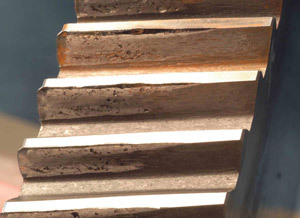 A lubricant with inadequate anti-scuff additives caused scuffing on this spiral bevel pinion. The fatigue life of gears and bearings is adversely affected by water. 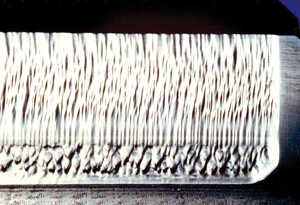 For example, as little as 50 ppm of water reduces rolling bearing fatigue life by 75 percent. Therefore, the Karl Fischer titration method (ASTM D6304) should be used to determine the water content. Other laboratory tests such as viscosity, spectrometric analysis and infrared analysis can help determine if other fluids such as the wrong oil, flushing oil or coolant contaminated the service oil. Spectrometric analysis might disclose contamination via environmental dust by showing high concentrations of silicon and aluminum. 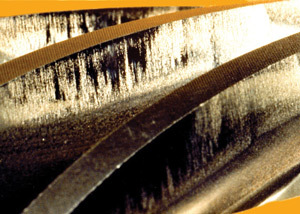 A lubricant contaminated with water produced corrosion on this helical gear. The oil might lose its ability to lubricate if its viscosity changes significantly or if it is oxidized. The manufacturing tolerance on viscosity is plus or minus 10 percent. Therefore, ISO VG 320 oil should have a viscosity that falls within the range of 288 to 352 centistokes at 40 degrees C.
There are many possible causes for an increase or decrease in viscosity. For example, some oils have additives known as viscosity-index (VI) improvers that might not be shear stable. With time in service, these oils lose viscosity because the VI improvers shear down. Does the Oil Contain Evidence for Finding the Root Cause of Failure? Wear debris in the oil may help indicate failure modes that occurred in the gearbox and reveal contaminants that contributed to the failure. Spectrometric analysis can uncover contamination via environmental dust by showing high concentrations of silicon and aluminum. These results might explain abrasion on gear teeth and bearing surfaces. 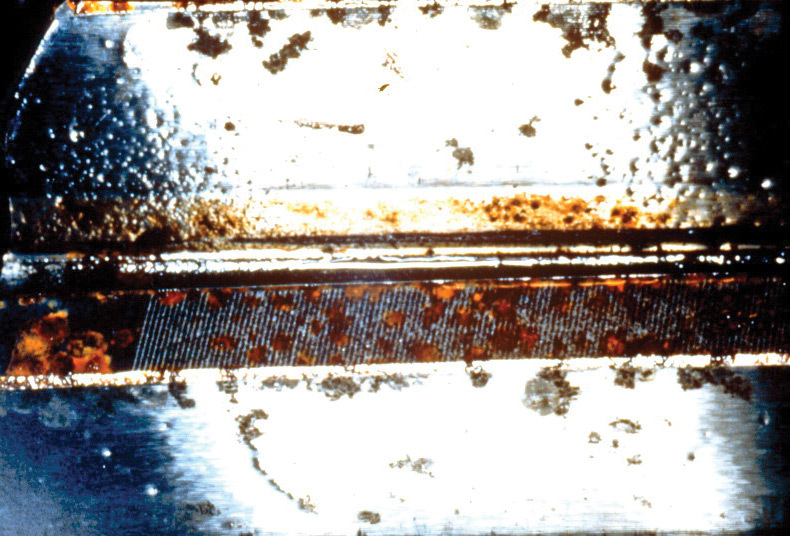 Depletion of anti-scuff additives may confirm a scuffing failure, and excessive water concentration might explain corrosion. 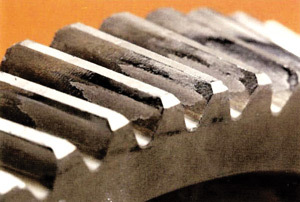 Other test methods used to monitor abnormal wear of gearboxes include ferrous density, particle counting (ASTM D7647) and analytical ferrography (ASTM D7690). Direct reading (DR) ferrography is a ferrous density test that measures the amount of ferrous wear debris in an oil sample. The results of DR ferrography are generally given in terms of DL for particles greater than 5 microns and DS for particles less than 5 microns in size. 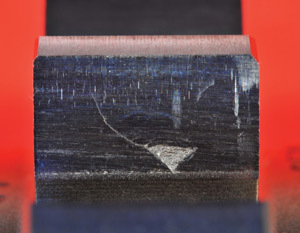 Analytical ferrography allows wear particles to be observed by the analyst via microscopic analysis. In this evaluation, active machine wear as well as multiple different modes of wear can be determined. This method has an outstanding sensitivity for larger particles. Particle counting in industrial gearboxes tells the same story as particle counting in a hydraulic system or pump application - that of cleanliness. When establishing an oil analysis program that is proactive in controlling contamination, particle counting is a vital component to the routine test slate. 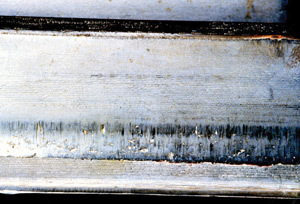 (PSO) macropitting caused by tip-to-root interference. have been caused by tip-to-root interference. If the oil appears very clean, it might have been changed after the failure occurred. Therefore, check maintenance records and interview maintenance personnel to determine whether the oil is representative of the oil that was in service when the failure took place. Always use clean, lubricant-compatible plastic or glass sample bottles and caps, and keep all sampling equipment thoroughly clean. Prior to sampling, fill out the label and attach it to the sample bottle. Be sure to record the sample point and the date. Drain the oil through the screen to capture any large wear debris or fracture fragments that might be entrained in the drain oil. Take the first oil sample at the start of the drain. Be prepared to capture any free water that may have settled in the gearbox. If there is a large quantity of water, fill a sample bottle and then capture the remaining water in the large bottle. Once the water stops flowing, take a sample of the oil. resulted in abrasion on this spur pinion. Take the second oil sample near the middle of the drain. Estimate the oil level in the gearbox from the sight gauge or from direct measurements. This sample will be used to determine bulk oil properties that are more representative of the in-service oil properties. Take the third oil sample near the end of the drain. This sample might capture less dense contaminant fluids. When all the calculations and tests are completed, form one or more hypotheses for the probable cause of failure and then determine if the evidence supports or disproves the hypotheses. While similar procedures apply to any failure analysis, the specific approach can vary depending on the nature of the failure and time constraints. So whether you perform tests on-site or send oil samples to a laboratory for further analysis, be sure to select the appropriate test to help you correctly determine the probable cause of a failed gearbox. Robert Errichello is a gear consultant with GearTech. Contact him at geartech@mt.net. An article from Reliable Plant Newsletter. How Important is the ISO Cleanliness Code in Oil Analysis? The International Organization for Standardization (ISO) has developed a cleanliness code that is the primary piece of data reviewed on most industrial oil analysis reports. The value of this code can help determine the overall cleanliness of the monitored system. Often times, an end user will establish a target value to achieve, thus offering a level of confidence so long as the used oil sample meets this established target. The trend in the oil analysis world is to give too much credit to the value of the ISO cleanliness code. Some laboratories have even begun to only report the ISO code. There is also a heavy reliance on this value by end-user analysts. The ISO code is a fantastic tool to use for setting target alarms and establishing a goal to achieve and maintain as it relates to system cleanliness. It is also the perfect value to use for key performance indicator (KPI) tracking, charting and posting. However, the ISO code should play only a secondary role when it comes to evaluating used oil sample data. Most oil analysis samples that receive particle counting are getting what is known as automatic particle counting (APC). The current calibration standard for APC is ISO 11171. When sending a sample through an APC, particles are counted either through laser or pore blockage methods. Although different laboratories may report different particle count micron levels, an example of the various reported micron levels includes those greater than 4, 6, 10, 14, 21, 38, 70 and 100 microns. ISO 4406:99 is the reporting standard for fluid cleanliness. According to this standard, a code number is assigned to particle count values derived at three different micron levels: greater than 4 microns, greater than 6 microns and greater than 14 microns. The ISO code is assigned based upon Table 1. This can be seen in the example on the left. However, without seeing the raw data, the only thing the ISO code can positively identify is whether a sample has achieved the desired target value. The ISO code does nothing to help determine any type of real trend information unless the value of the raw data at the given micron levels changes enough to raise or lower the ISO code. It’s easy to look at the ISO table and notice a pattern. At each row, the upper limit for each code is approximately double that of the lower limit for the same code. Likewise, the upper and lower limits are double that of the upper and lower limits of the next lower code. This is known as a Renard’s series table. The unit of measure for particle count data is “particles per milliliter of sample.” The particle counters used in laboratories incorporate much more than a milliliter of sample. During the testing process, approximately 100 milliliters of sample are taken into the instrument. The numbers of particles are counted based on this value. The total number of particles is then compared to the number of times that 2 will go into that total count exponentially. Why is cleanliness so important? The answer is simple: competition. In such a globally competitive market where products can potentially be manufactured and shipped from overseas at a lower cost than can be manufactured from here at home, maintaining a precise level of reliability and uptime is necessary to keep costs at a manageable level. Contaminant-free lubricants and components will extend the lifetime of both, and in turn increase the overall reliability of the equipment. Using the previous example (20/17/13), this means that at the greater than 4 micron level, the number of particles measured was at the most 2^20 and above 2^19. Since particle count data is reported in particles per mL of sample, the raw data must be divided by 100. While the general rule of thumb is that for every increase in the ISO cleanliness code, the number of particles has doubled, this certainly is not the case in every situation. Because the number of allowable particles actually doubles within each code number, it is possible for the number of particles to increase by a factor of 4 and only increase a single ISO code. This becomes a significant problem when you have a target cleanliness level of 19/17/14, your previous sample was 18/16/13, and your most current sample is 19/17/14. For all reporting purposes, you have achieved and maintained the target cleanliness level of 19/17/14. This suggests that your component should be in a “normal” status. Given the information presented previously, it is easy to see how you could have two to four times the amount of particle ingress and only increase by a single ISO code or have no increase at all. The ISO cleanliness code should be used as a target. It is a value that is easily tracked for KPI reporting and a value that most people can easily understand. However, using the ISO cleanliness code for true machine condition support is limited in its effectiveness. The raw data from particle count testing allows the end user to confirm data from other tests such as elemental analysis and ferrous index. The ISO cleanliness code does not allow this cross-confirmation to occur. Reviewing the raw data of the particle counter at all reported levels is absolutely vital in performing quality data analysis on oil sample data. Reliability & Safety goes hand in hand! Unfortunately, not everyone makes the tie that reliability and safety go hand in hand. I am reminded of a letter that Dave O’Reilly, the CEO of Chevron Corporation, sent to employees where he said, “Reliability, like safety, is a critical element of operational excellence and requires our constant attention.” I couldn’t agree more. Reliability drives safety and vice versa. Consider that most accidents don’t occur when things are running smoothly and the equipment has a high level of reliability. Accidents occur when we fall into reactive chaos. When a packaging machine is no longer operating in a reliable state, lots of minor stops may cause an operator to reach into a running machine (bypassing the safety procedures) and remove jammed cartons or film. The moment of frustration may cause the loss of a finger, hand or worse. Less spending on maintenance may result in more leaking piping or vessels. The operator gives up on keeping the floor clean. Now, not only are the pipes leaking, but the main process line is acting up. When the product piles up on the end of a main conveyor due to a neglected bearing, the operator makes a mad dash to clear the pileup. On the way, he or she slips and falls in the area where the leak has created a puddle on the floor. The spiral only worsens. The challenge that we face as maintenance and reliability professionals is to connect the dots for our leadership. We have to elevate maintenance and reliability as a profession and not have it viewed as “a necessary evil.” Sure, it is one of the most controllable costs in a site. When you toss out labor as a “sunk cost” (X number of people to produce X number of widgets), the largest (and easiest target) is the maintenance budget. Most every other cost requires capital to influence (energy costs, as an example) or is fixed via contract (logistics, raw materials, etc.) or global pricing. While it is one of the most controllable costs, maintenance and reliability can be one of the greatest drivers of productivity and reduced costs. This is done not by slashing the budgets indiscriminately, but by keeping the focus on reliability as a long-term investment strategy. So when you are asked by the CEO or plant manager about reducing reliability costs, ask if that leader is willing to reduce the organization’s investment in safety. received in Reliable Plant Newsletter. Can Maintenance and Operations Coexist? Most of us come from traditional plant organizations with an operations group and a maintenance group with their own supervisors and specialized skilled crafts. One of the major European postal services decided in the late 1990s to make a change in their plant maintenance organization. In my own U.S. Postal Service, there had been talk for years of combining the operations and maintenance supervision and reducing the supervisory ranks. It is easy to say, but how do you do it? Be careful of what you wish for. They negotiated with their union to change the working condition of “supervision” (changes in hours, wages and working conditions are negotiated contractual obligations) to put the operating equipment technicians under the operations supervisors. In doing so, they split the maintenance craft workforce and established a plant facilities maintenance support function separate from the operations maintenance function. The facilities function had responsibility for everything but the operating equipment. That included storeroom, custodial, HVAC, all the plant’s infrastructure and the computerized maintenance management system. Work order estimating was done by the facilities planners. Operations now had control of their own machines, both production and maintenance. The thought was to make teams that could work together and decrease downtime, better identify degradation sooner, and “keep the maintenance employees involved.” In mail-processing plants, there is considerable time spent by maintenance personnel on “area assurance,” of which operations wanted to take advantage. The supervisors had problems communicating with the technicians and vice versa. The supervisor could add nothing of value to assist the technician when a piece of equipment was down and also did not know how to judge technician performance. Supervisors tended to drift toward the operators and avoid the technicians until something broke down. Technicians felt they were subordinated to the operators and felt unappreciated. This led to a reduction of discretionary effort and creativity as it was not recognized. The area assurance was misunderstood, and supervisors were uncomfortable for appearing lax toward technicians and pushing the operators. Cooperation between the two factions was less than before the big change. The technicians felt disenfranchised, not really belonging. In maintenance, they had camaraderie, mutual support, management that championed them and a home. Issues arose over planned work orders between the technicians and the estimators, and between the estimators and the supervisors, with the supervisors trying to understand the now fragmented process for which they used to be a benefactor, but for which now had a part in completing the work order. This was implemented one plant at a time, and it became evident that maybe a plant-by-plant evaluation should determine the readiness to attempt this change. It resulted in a decision that “one size does not fit all,” and that there could be two approaches: Leave some plants as they are and implement the new structure through a modified process to address the learning from the earlier-on plants. Some early plants reverted back. It also became evident that retrained maintenance supervisors may be more successful in managing a mixed team of operators and technicians. The lessons are many in this story. I believe that planning for such a change must focus on the roles of each player. I am a believer in getting people to verbally walk through a typical work day as though they were in the new process. This should be done with teams of all involved. Not only should this be early on to beta test a concept, but should be carried forward for all employees involved in every installation. If you are considering any kind of change, this story is a good beginning for facilitated training sessions on enabling change, along with all of the other process management redesign tools that quality and re-engineering bring to the table.